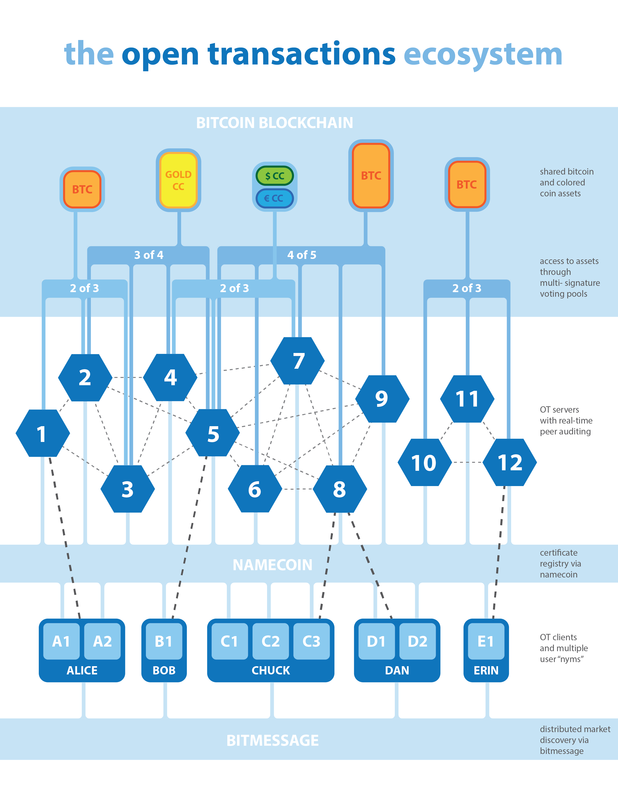 Open-Transactions is an easy-to-use, financial crypto, digital cash and transaction library. Open-Transactions includes a client API, a working server, a cross-platform GUI and a command-line wallet utility. Open-Transactions features: a large variety of financial instruments, markets, basket currencies, unforgeable account balances, digital cash, destruction of account history, Ricardian contracts, Smart Contracts (scriptable clauses), and more. Open-Transactions allows users to issue and manipulate digital assets. Any issuer can sign and distribute new currency contracts in order to create new digital asset types. Users may create many pseudonyms (public keys), each of which may own asset accounts of various types, on OT servers. Users can operate "cash-only" for maximum anonymity, using untraceable digital cash. Users can transfer digital assets securely and provably, with receipts signed by all parties. Even an OT server cannot change balances, or forge transactions--since it cannot forge your signature on your receipt. Open-Transactions supports a range of financial instruments such as account transfer, cheques and vouchers (aka "cashier's cheques" or "banker's cheques"), in addition to cash. These instruments are all analogous to the same financial instruments that we all use at normal banks today. Everyone already has an intuitive understanding of these financial instruments, because we use them regularly in our normal daily lives. Open-Transactions also implements higher-level, contract-based transactions such as payment plans and markets with trades. The markets on Open-Transactions support market orders, limit orders, fill-or-kill orders, day orders, stop orders, and stop limits, just like trading on a real market. Smart contracts: Multi-party agreements with scriptable clauses... including hooks, callbacks, internal state, etc. Client-side scripting: !/usr/bin/env ot The entire (mostly) high and low level OT API is available within your scripts. All of this is accomplished in such a way that all parties are able to prove, at all times, which transactions have cleared and which instruments are authorized, without having to store their entire transaction history, but instead by merely keeping the last signed receipt. Without the special mechanism that makes this possible, all parties would otherwise be forced to store all receipts forever. Nyms and Asset Types have consistent IDs across all OT servers, since the ID is formed by hashing the relevant contract or public key. No—quite the opposite. Open-Transactions is highly decentralized. 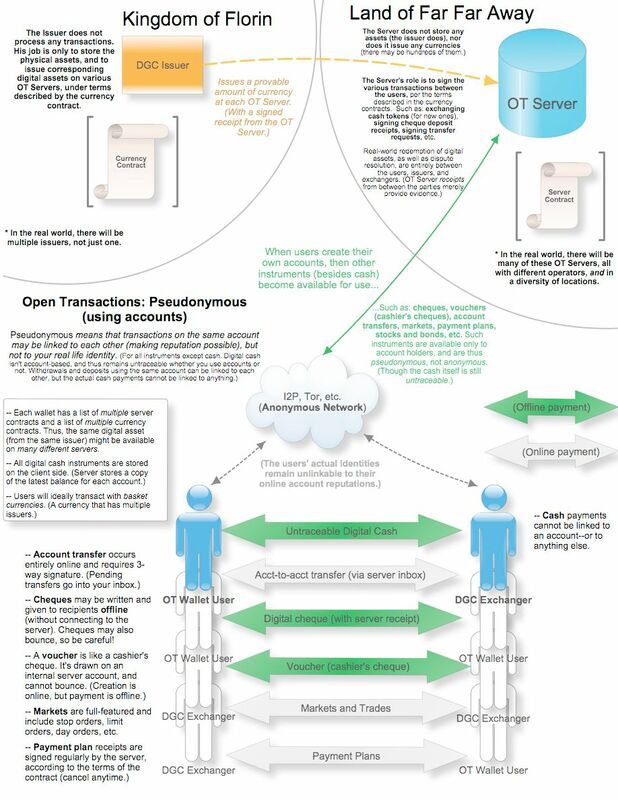 An OT server does not control user transactions—it merely notarizes them. 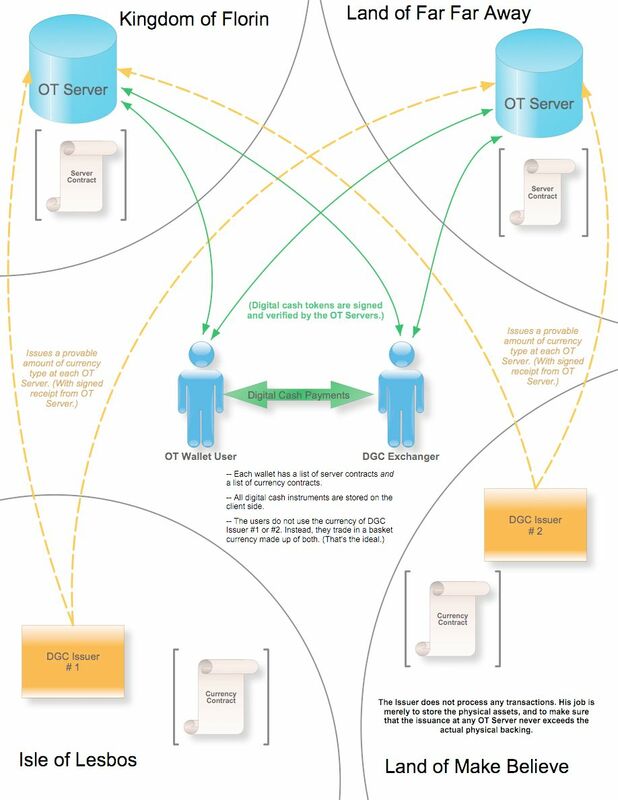 Anyone can operate an OT server, and users can go to any OT server to notarize transactions. Thus OT servers compete with each other to attract users to use their notary services. Anyone can download an OT client, and use it to execute transactions on any OT server, or any group of OT servers. OT uses triple-signed receipts, so transaction parties have independent cryptographic proof of transactions and balances. OT servers do not store user assets. Rather, cryptocurrencies are stored in voting pools so the server can't steal them. In every way, the user is in control, not the server—even when you're using servers you do not trust. These characteristics generate a federated network architecture—similar to the internet, and it has the same virtues as the internet—openness, decentralization, resilience, censorship-resistance, and user control. The community behind OT is strongly committed to developing systems that give users full control over their own assets and information. Interview with "Let's Talk Bitcoin"
Stash - Enterprise platform based on OT. Monetas - Transaction platform inspired by OT. Many financial instruments are supported: Users can write cheques, purchase cashier's cheques ("vouchers"), and withdraw in unlinkable digital cash. The software uses Chaumian-style, blinded tokens courtesy of the Lucre library by Ben Laurie. It's like PGP FOR MONEY. The idea is to have many cash algorithms, not just Lucre. I’d like to add Chaum’s version, Brands’ version, etc. So that, just like PGP, the software should support as many of the top algorithms as possible, and make it easy to swap them out when necessary. User accounts are pseudonymous. A user account is a public key. (This is like PKTP by Andrew McMeikan.) You can open as many user accounts as you want. Full anonymity is possible only for "cash-only" transactions (where users only perform token exchanges, and do not open accounts), whereas pseudonymity means that transactions can be linked to the key that signed them. (While the real life identity of the owner is hidden, continuity of reputation becomes possible.) See full-color diagrams linked above. Open Transactions also features markets. Any two asset types can be traded against each other. The markets are full-featured and include limit orders, stop orders, fill-or-kill, day orders (date ranges), and stop limits. Smart contracts: Multi-party agreements with scriptable clauses... including hooks, callbacks, internal state, etc. This concept was originated by Nick Szabo: smart contracts. Contracts, in general, are very important to Open Transactions; they are the building block of the entire library. Open Transactions uses a Ricardian-style contract, and all the various instruments, data files, and messages resemble PGP-signed XML files. All objects serialize to a string. The philosophy of the software is based around separation of powers (issuers and transaction servers being separate entities) as well as the distribution of risk. For example, Asset accounts can be distributed across multiple servers, and asset types can be distributed across multiple issuers (via baskets.) Read about the Auditing protocol. Potential future instruments include: Real Bills, dividend-paying stocks (the same mechanism can be used as interest paying bonds) and collateralized debt obligations. (OT supports payment plans, so it would be easy to group tranches of OT's payment plans to pay into a single reserve account, as backing for a new stock offering that could be traded on OT markets.) This is similar to how basket currencies are implemented. Stocks/Bonds would pay shareholders by dropping a cheque into your stock account's inbox. These features aren't available yet, but they are easy to add given the existing OT infrastructure. All communications are secured with OpenSSL. All messages are also signed and encrypted. All transactions require signatures from relevant parties including the server. The software is fully cross-platform: Linux, Mac OS X, FreeBSD, Android, and Windows are supported with makefiles, project files, and instructions. STORAGE... The library itself is storage neutral, and could be utilized across a variety of different storage systems. All objects serialize to a string, and it is very easy to add support for new storage methods. (Currently OT uses the filesystem with key/value pairs.) Adding a new storage method is as easy as subclassing OTDB::Storage and overriding a few methods. Use any DB you want. Messaging... The library itself is transfer-protocol neutral, and can be utilized across a variety of different transfer protocols. The default implementation uses the ZeroMQ library for transport. Transport is implemented as a callback function, so it's very easy (a few dozen lines of code) to swap in some other system, if you wish. OT currently supports MsgPack and protobuf for data packing, though new packers can be added by subclassing OTDB::Packer. The intention is for this software to be integrated as many places as possible... Games, digital cash wallets, distributed data stores, secure voip apps, anonymous bit torrent networks, mixnets, remailers, nym servers, etc. There are many other potential uses. This page was last modified on 5 December 2015, at 05:55. This page has been accessed 492,033 times.